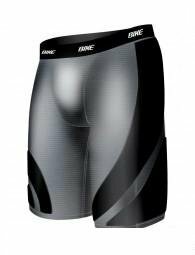 The Bike(r) Hit Series basketball shorts offer a unique high-density foam padding that dissipates hits while being breathable. The moisture-wicking polyester/spandex material keeps the skin cool and dry during any fast-paced 5-on-5 action. The strategically placed padding shields you from impact to the hips and thigh areas.